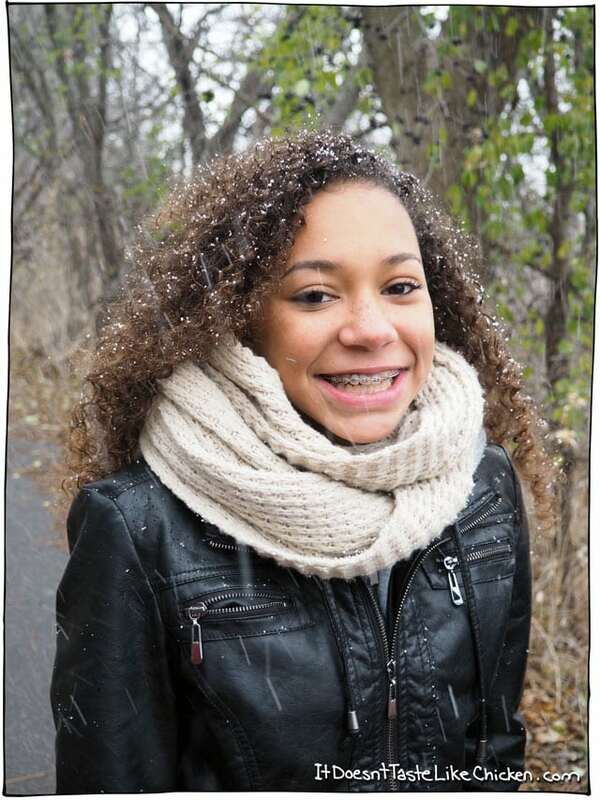 Both the snow photoshoot and the apple cider photos were captured with an Olympus PEN E-PL7 and Olympus Digital 14-42mm 1:3.5-5.6 II R MSC Lens. Aren’t they so pretty!? There is something so striking about the first snow of the year. Even though I grew up in Canada and snow happens every year, the first snow always feels like magic is falling from the sky. Big, white, puffy, angelic, snow flakes lightly zig zagging towards the ground. Seriously takes my breath away. I can’t help but stare out the window and watch this magic happen before my eyes. I mean, eventually we will reach the point of “are you serious? MORE snow? It’s April!” But for now, the snow is still charmingly new, fresh and sparkly. 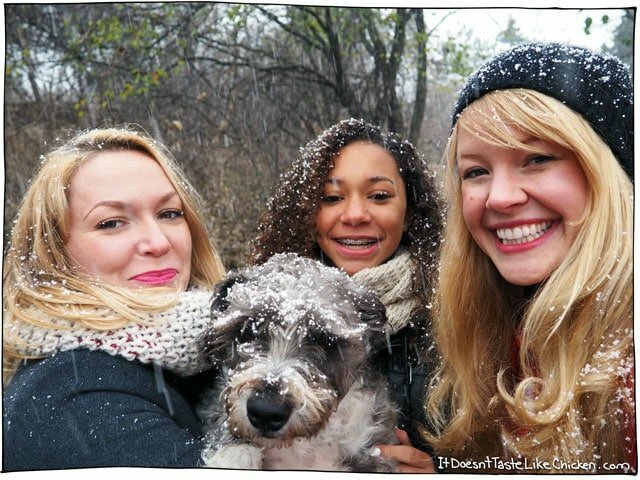 The three of us decided we MUST capture this moment immediately, because snow flakes just look so darn pretty in our hair. True story folks. So I grabbed my Olympus PEN E-PL7 (also new and sparkly) and we dashed into the forest. This moment called for my PEN instead of just using my phone. It really took the moment from every day snaps, to a full on photoshoot with high quality pics. These babies are totally framable. The PEN is a pretty nifty camera. ↑↑↑ see how nifty it is? It not only takes gorgeous high-quality photos, but it’s designed for social media hounds (like me!). It has a screen that flips down so you can see yourself, making selfies a breeze (it worked wonders for our group shot)! It also connects to wifi, and you can connect it to your social media accounts to post your photos directly. How neat is that? 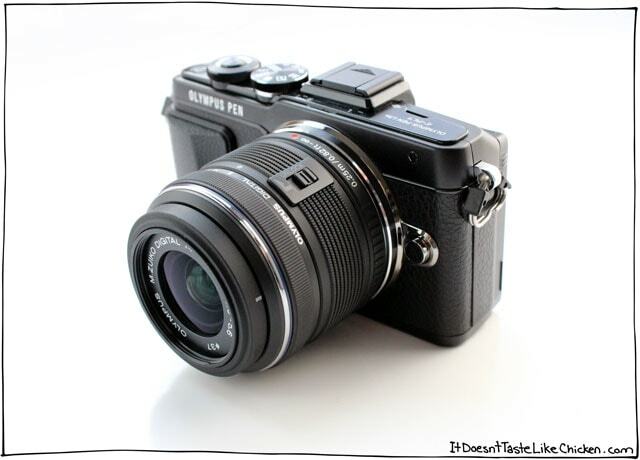 There are some really neat little videos on the Olympus PEN site showing all of the fun features, but me, I just like good ‘ol high res shots. Shall we take a look? We shall. Look at this glowingly gorgeous lady! I love how the snow and grey tones of the forest and sky made a perfect backdrop for our seasonal photoshoot. What a babe! Ow ow. I mean, come on! Really? Could you have a more photogenic 13 year old? I think not. Zuzu wanted me to assure all of you that her coat is pleather. Haha! And this little muffin of an animal. Cute lil’ Lizzy dog. I don’t think she was as impressed with the snow as we were, but she had fun sniffing things. Dog life. Then there’s me, being the over-smiling goof that I am. Note to self, bring gloves next time, snow is cold. Apparently I am still not great at dressing for cold weather. After this frozen photoshoot we all needed to warm up. 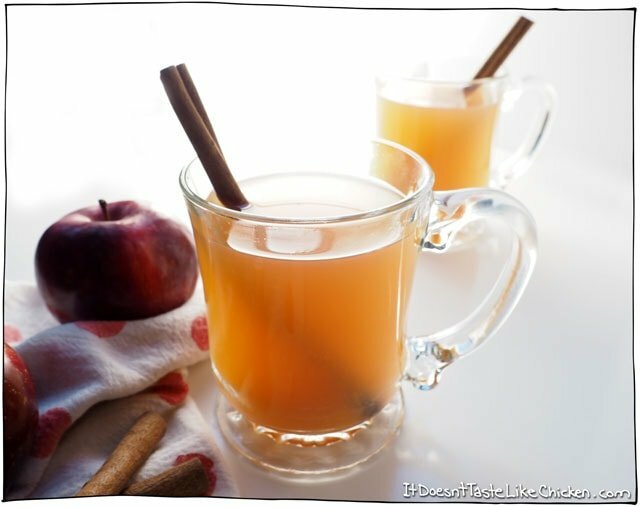 I unfortunately had not made this apple cider yet, but I sure wish I had!! 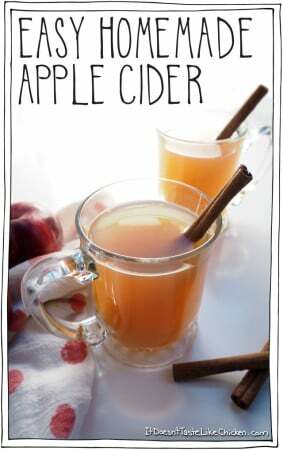 This Easy Homemade Apple Cider is the PERFECT treat to have ready for such occasions. Just chop up the fruit into quarters, chuck everything in a big ‘ol pot (cores, peels, and all), and simmer for 2 hours. Strain out the fruit and spices and pour a warming cup of holiday cheer. My roommate was in love with the scent that filled our house. If you want to impress company, have this simmering away on the stove. Christmas is in the air! Make this and your whole house will smell like heaven! Pour a warming cup of holiday cheer. Wash the apples and oranges and then quarter the fruit. No need to removes any seeds, skin, cores, or peels, these will all be strained out later. Add your chopped fruit to a really big pot. Add in the remaining ingredients, the cinnamon sticks, cloves, allspice, brown sugar, and water. Bring the pot to a boil and then reduce to simmer. Simmer for about 2 hours until the apples breakdown and it smells delicious. Put a fine mesh strainer over a large bowl or another really large pot, and strain out and discard the fruit and spices. Serve hot with a cinnamon stick for garnish. HOW Would this turn out if I tried to preserve it? 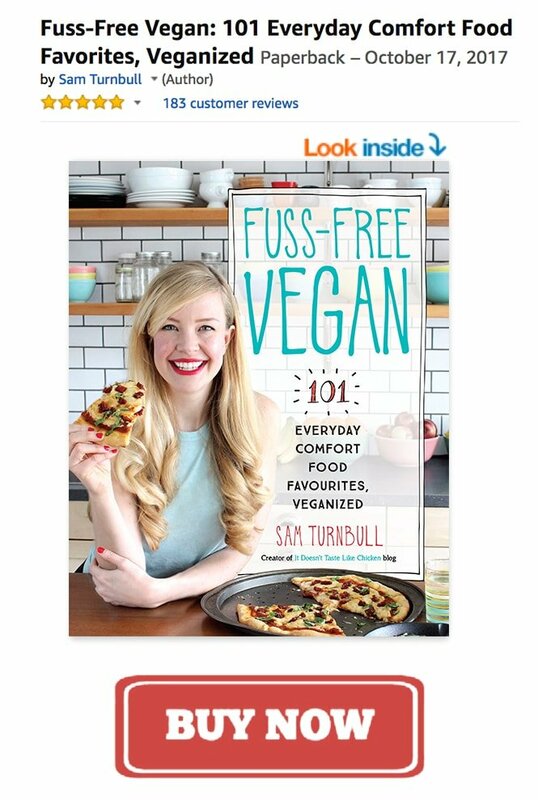 Maybe by pouring it into ice cube trays and then putting the frozen cubes into baggies? Hi Judy, yes you can freeze it. Just pour into freezable containers or sealable bags leaving room for expansion. Enjoy! Beautiful ladies (and pup)! The apple cider sounds delicious. However, that said, I can attest that this apple cider recipe is super simple and fills the entire house with the most amazing aroma. Oh, yeah, and it’s delicious too. Thanks Sam. I’m sipping some now on this rather damp, dreary December day. We didn’t get snow last year, and I’m so close to Canada. I hope we do this year. 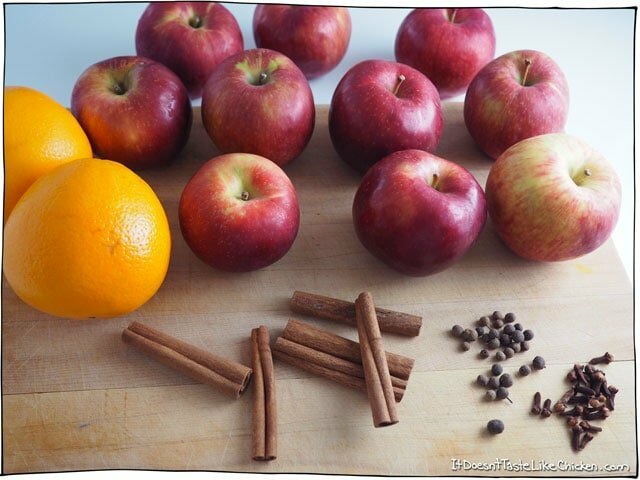 Will make this cider when my son comes for Christmas. I hope you do too! 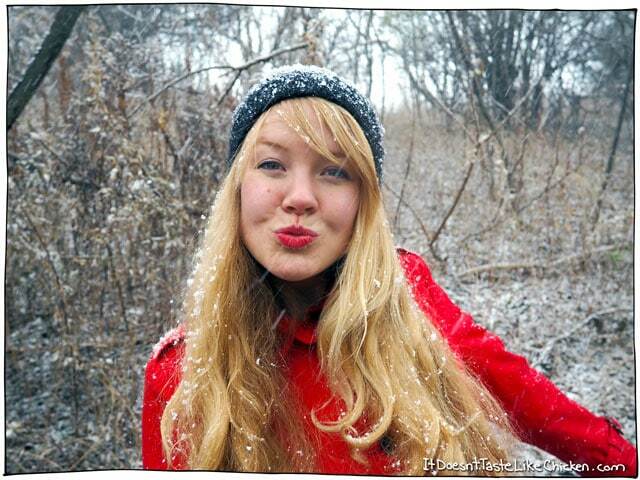 As much as I like the warm weather, snow on Christmas is just breathtaking… especially with hot apple cider! 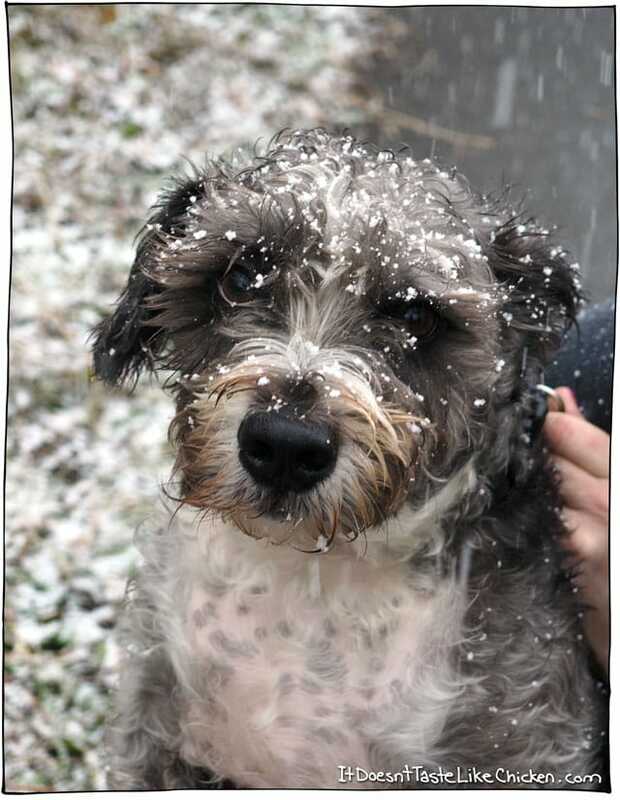 What awesome pictures…I love snow too!!! I really like your cider recipe…not complicated like one recipe I saw!!! I am definitely trying this!! Thanks!!!! The pictures look beautiful! I’m so jealous of that pillowy snow…we don’t really get much (read: any) of that down in Louisiana. Thanks so much for the recipe! I’ve been looking for an apple cider recipe. Love all three of ya. Beautiful pics of beautiful women.